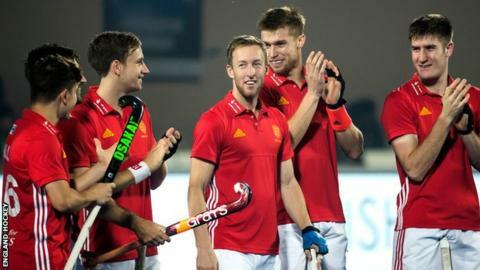 England survived a late scare to secure a 2-2 draw with Australia in their last group game at the Hockey World League final in India. The Kookaburras hit the post twice in the final minute of the Pool B match, which marked Barry Middleton's 400th international appearance. Liam Ansell gave England an early lead, before Australia equalised and then took a 2-1 lead in the third quarter. But Bobby Crutchley's side hit back in the 54th minute through Phil Roper. Substitute goalkeeper Harry Gibson and his defenders faced four penalty corners in the last 30 seconds of the game to deny reigning World League champions Australia their first win of the tournament. England started the game well, following their victory against the hosts India on Saturday, and a good run by David Goodfield led to Ansell's dinked opener. Australia increased the pressure in the second quarter, and Dylan Wotherspoon equalised after half-time, despite an England review. Captain George Pinner pulled off a series of stunning saves before Australia's persistence paid off after 41 minutes. England drew level with six minutes remaining when the ball broke kindly for Roper who nudged it into the net. Middleton, who received an ovation on the pitch from his team-mates, is only the fifth player of any nation in international hockey to reach the landmark of 400 games in his appearances for both Great Britain and England. "I'm incredibly proud," said Middleton. "It was great that the Aussies all offered me their congratulations, I think that's a first! I'm still really enjoying playing and I really relish the opportunities with this group moving forward." Monday's result means England finish above Australia in the final group standings. Germany topped the group after their 2-0 win over India. England will learn their quarter-final opponents following the completion of the Pool A fixtures on Tuesday. All eight teams progress to the quarter-finals, with their finishing position in each pool determining the last-eight ties. England squad: Harry Gibson, Henry Weir, Sam Ward, Mark Gleghorne, Phil Roper, Adam Dixon, Barry Middleton, Brendan Creed, David Goodfield, David Condon, Liam Sanford, George Pinner (captain), Luke Taylor, Harry Martin, Liam Ansell, Chris Griffiths, James Gall.